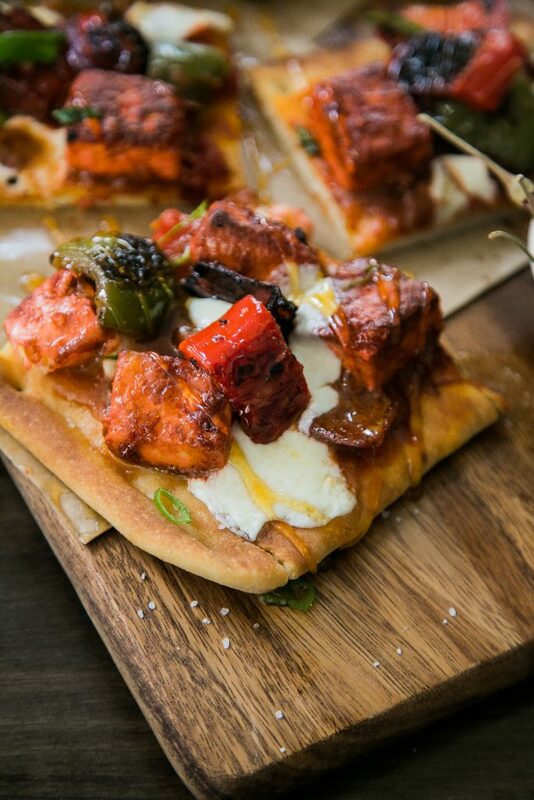 Alright guys, you know Im not a huge fan of paneer but this chili paneer pizza is something ANYONE can get down with. I used Stone Fire Pizza Crust but you can use a fresh dough, refrigerated dough, or any sort of flatbread as well! 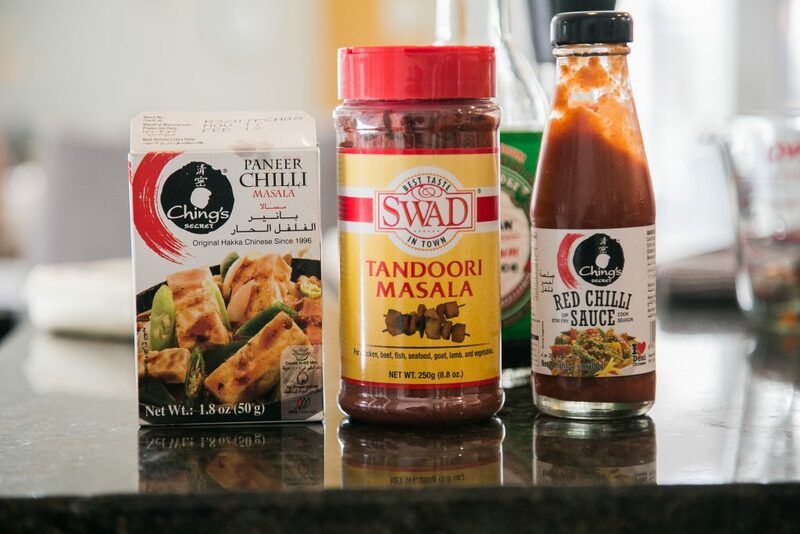 Dried Red chilis can be found at the Indian grocery store along with all of the Ching’s masalas and sauces I have used. The thai sweet chili sauce- can be tricky to find- but sometimes local grocery stores will have it and you won’t have to trek to an Asian market to get it. If you can’t find it, use some Mike’s Hot Honey or just regular honey to drizzle on top of the pizza! This pizza is supposed to be sweet and spicy so please adjust seasonings to how you like (add more of the serrano chilis if you want a lot more kick). You can also add in some mushrooms and corn if you like- I think they’d work well in this recipe. 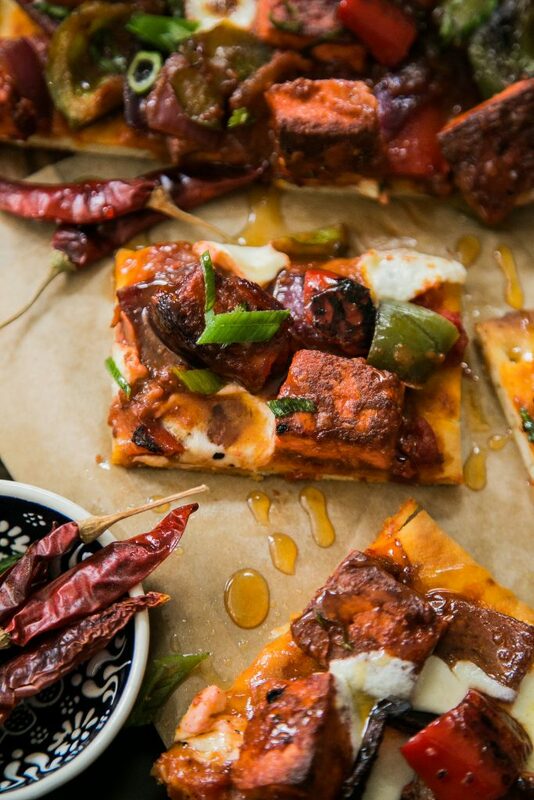 If you want to add a few spoons of pizza sauce to the base before the chili paneer- you can do that as well- and don’t skimp on the cheese- it brings it all together! 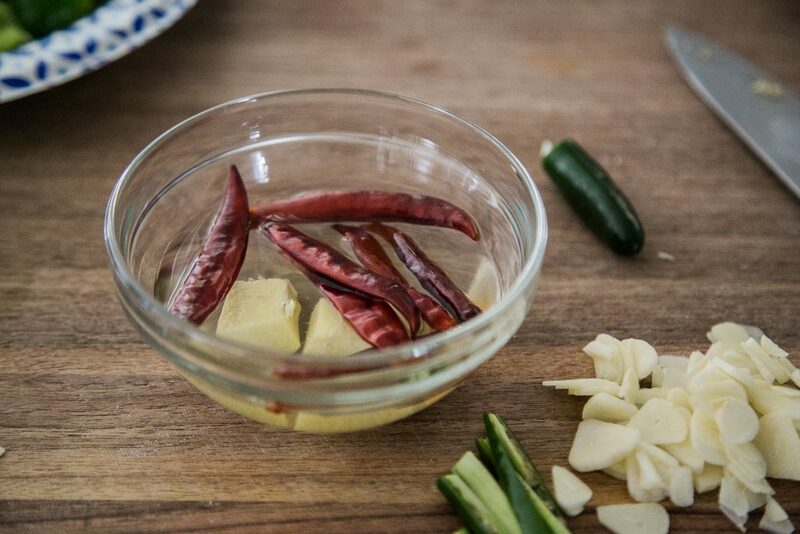 In a small bowl, soak the dried red chilis, ginger in 1/4 cup very hot water and let sit for 20 minutes. After 20 minutes- blend this mixture until smooth. In a large bowl, whisk together water, all purpose flour, corn flour, salt and pepper until it is mixed well. It should be not too thick and not too thin. Toss the paneer into this mixture until its all coated. 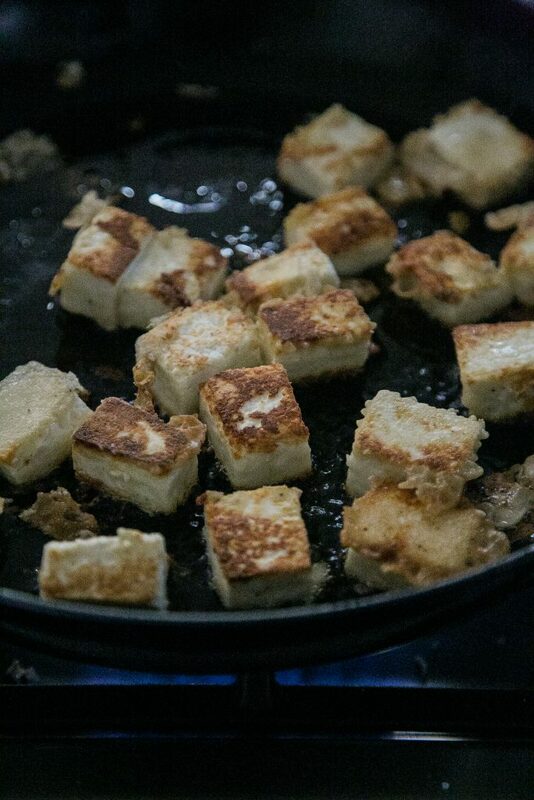 Fry the paneer on both sides until golden brown and remove to a plate lined with paper towels as you finish frying them. In a deep wok or pot, heat 3 tbsp oil over medium heat. Add the sliced green chilis and let them splutter for a few seconds. Then add the ginger/chili mixture and cook on medium heat- stirring continuously for 4-5 minutes or until the liquid has reduced by about a half. Add the bell peppers and onions and cook for another 3-4 minutes (you want them to have a crisp texture- so do not over cook them). Add the chopped garlic and keep stirring for 3-4 minutes (you don't want the garlic to brown). 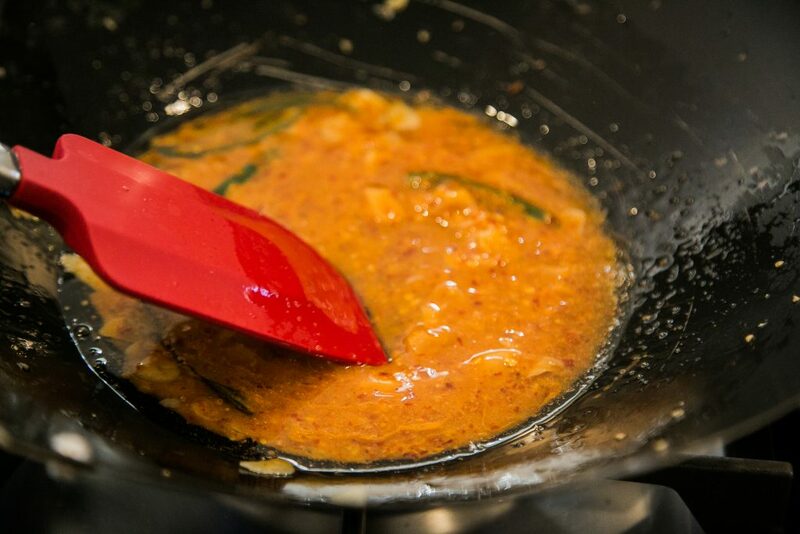 Add the chili masala, chili sauce, vinegar, soy sauce, vinegar, tandoori masala, honey and keep stirring. If it looks like you need more liquid-- add water in small amounts as you go. Turn the heat to medium/low so the sauces to not burn and continue to slowly thicken. 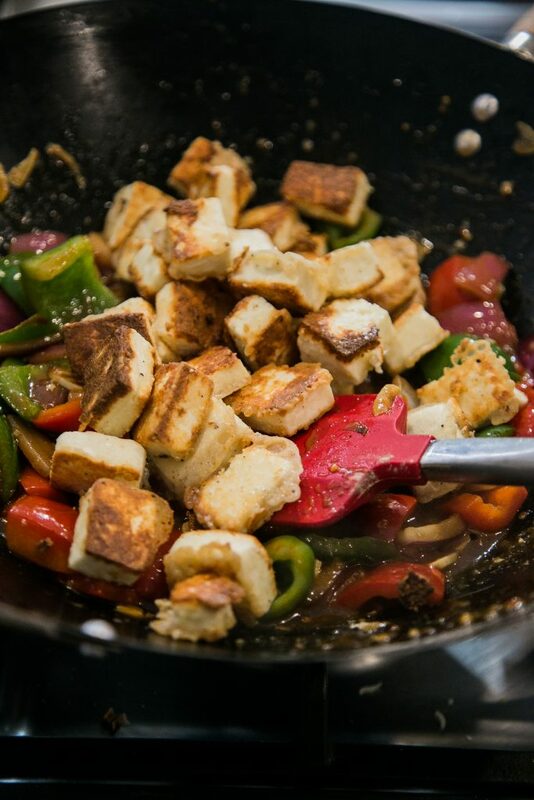 Add the paneer cubes to the pot and toss together well. If you like a crispier pizza crust-spread a little bit of oil on the pizza base and bake for about 6-8 minutes on a wire rack or pizza stone first. 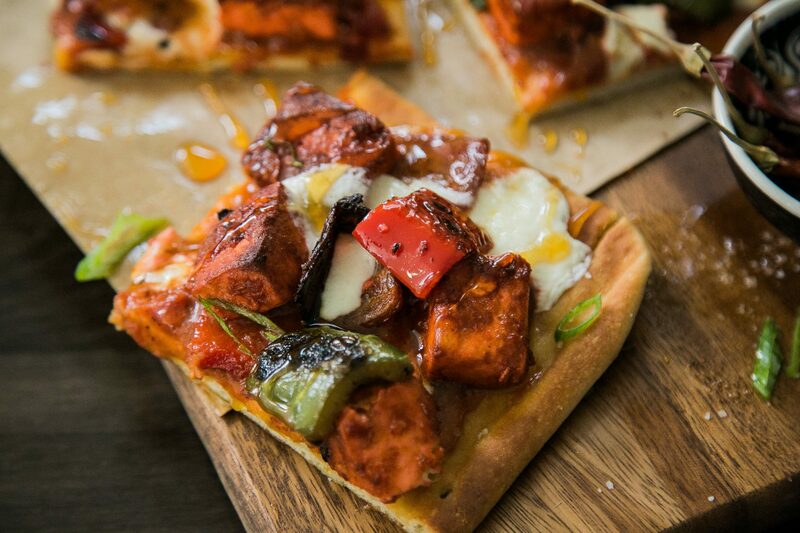 Remove the pizza base from the oven and spread the chili paneer evenly over the base. Spreading the base with store bough pizza sauce is an option here too if you choose. 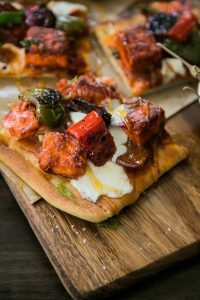 Spread shredded mozzarella generously over the chili paneer, top with sliced scallions and bake for about 8-10 minutes until the cheese has melted and pizza is crisp. Broil on low if you like to brown your cheese/toppings. Remove from oven, slice, drizzle with thai sweet chili sauce and serve hot!